Small Block was the first of its kind in Brunswick East, the forerunner of the cafe explosion that is still reverberating in a suburb previously more notable for being 'north of North Carlton'. Small Block is still a trendy place, but these days it can be hard to know who's setting and who's following the trends. Amongst their in-vogue offerings are coffee cups stamped with the cafe logo (as at North and Baba, whereas The Press Club stamps their paper overlays), a Thai-style breakfast dish (Tom Phat) and service that can veer to the brusquer side of cool (A Minor Place). Speaking of trends, as the first weekend of spring managed to maintain a temperature over 15C, some of Brunswick's best fashionistas were out and about: how about a super-short denim dress with socks and school shoes? This blogger pushes no fashion boundaries, but is happy to buck the trend when it comes to menu choice. The chosen dish fell squarely into the 'I'm never going to cook that at home' category: herb and mascarpone polenta with mushroom ragout and pecorino. Doing its best to impersonate a baked cheesecake in looks, the polenta delivered on texture and flavour. The outsides were crispy - an important texture contrast to the mushrooms. It's a bland grain on its own but the herbs added enough interest and it was subtly bulked by the mascarpone (presumably stirred through as one might parmaggiano). The mushrooms took their cue from the polenta and, with their deeply dark hue, impersonated a chocolate-cherry sauce to top the 'cheesecake'. The ragout had cooked down to a thick sauce, so it clung to the polenta, rather than letting rogue mushrooms escape around the plate. The sprinkle of shaved pecorino added some bite; I would argue for the sharper cheese to be mixed into the polenta instead of the mascarpone and to bulk out the ragout, rather than just topping up with rocket. SG's choice came out looking ready to attack! Sitting alone on a dinner plate, it represented another trend, followed/set by Gingerlee across the road: the ungarnished, unaccompanied steak sarnie. 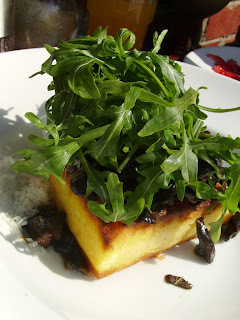 In other dishes (such as the herbed polenta), rocket regularly shows up unbidden and unannounced. Why not throw some next to the sandwich, or at least serve it on a smaller plate so the customer doesn't notice all the empty space? A gristle-free piece of steak was ably accompanied by sweet beetroot and a not-too-powerful aioli. 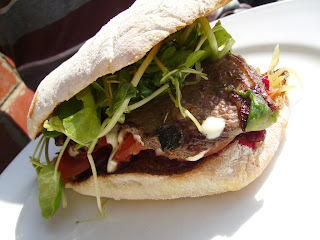 While there was no salad to pick at, the packed sandwich gratifyingly dripped morsels of food and sauce onto the plate to mop up with the ends of the soft ciabatta. I found your blog today and love the reviews. 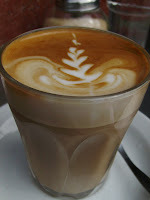 I am assuming you live around the Thornbury area and have noticed that you have tried pretty much everything around the area except Crunch Cafe and Mellisa's. I have to say that I am not at all a fan of Mellisa's food save for there cookies and little cakes but I HAVE to suggest one of my favorite food and coffee spots in Melbourne... Crunch. Simple food done really well, staff are super nice and the coffee is to die for. There is also a lot on offer for SG. Thanks again and keep on blogging!